The forsythia variety forsythia intermedia ‘Spectabilis’, or simply forsythia ‘spectabilis’, is a deciduous shrub and one of the most popular varieties of forsythia in general. Also, it is the variety most commonly used for hedging. 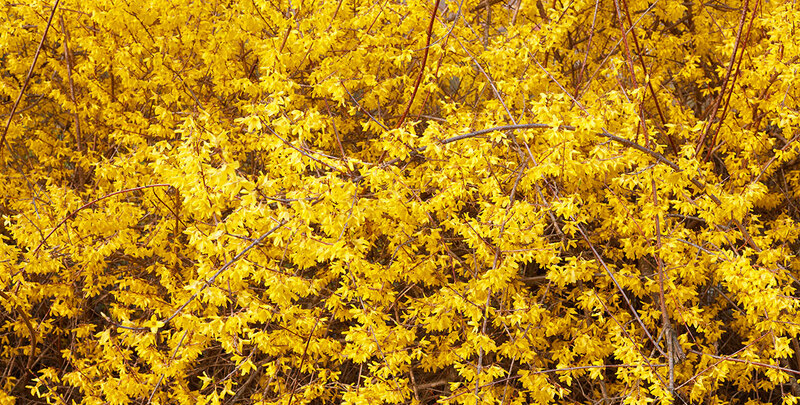 Forsythia ‘spectabilis’ makes versatile, lustrous hedges that flower profusely. In fact, it is one of the most heavily flowering varieties of forsythia and deciduous hedging plants as a whole. It is the abundance of fabulous yellow flowers in March and April in particular that set this cultivar apart. This is one of the characteristics that make the forsythia ‘spectabilis’ both an excellent specimen shrub and an ideal component of mixed hedges. Due to its relatively open structure, this cultivar does not make a good privacy hedge, but its aesthetic value more than makes up for that. Forsythia makes pretty informal hedges and will also look great in mixed borders, blended with a couple of evergreens or various native deciduous species with good hedging qualities. By itself, this large, showy, early flowering shrub which will liven up any garden. And while its bright, yellow flowers, which appear as early as spring, are an important part of its ornamental value, the autumn colouring is also quite spectacular. It is during this season that most of the oval leaves will turn yellow, while some others take on a wine-red colour. If you are looking to turn your garden into the best possible visual representation of the changing seasons, forsythia ‘spectabilis’ is certainly a hedge plant to consider. While the forsythia genus gets its name from the renowned royal head gardener William Forsyth, it actually originates from East Asia. In fact, the forsythia ‘spectabilis’ is a hybrid of the forsythia suspensa and the forsythia veridissima, both of which are originally from eastern China. In fact, the Chinese have been using several species of the forsythia genus as garden plants for many centuries. Forsythia species had not been introduced to European gardens until the eighteenth century, when the well-known Swedish botanist Carl Peter Thunberg brought these colourful, exotic plants with him on his journey back from the Far East. 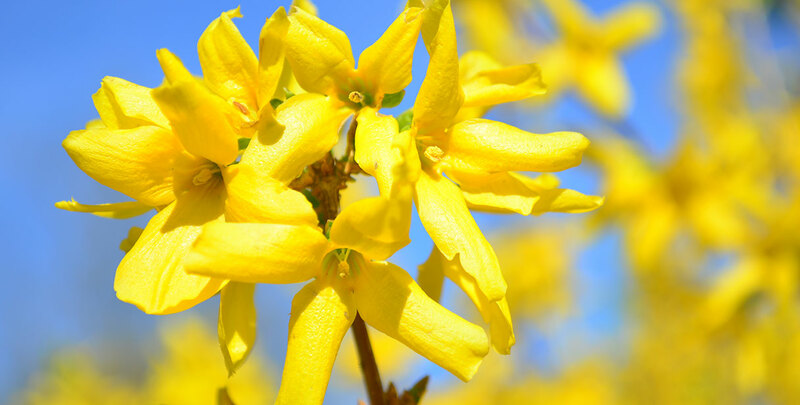 Naturally, it did not take long before people began to appreciate the lively, vibrant colours of the forsythia and as a result, its ornamental value was also recognized in Europe. Ever since Thunberg brought the forsythia to this part of the world, plant nurseries all across Europe and the UK have cultivated them so that they will thrive in our climate. The forsythia ‘spectabilis’ is one of the most successful cultivars since it was created in 1906. This is hardly surprising, as the display of colours that the forsythia ‘spectabilis’ has to offer is nothing short of breath-taking. Its yellow flowers appear relatively early, making them a prelude to springtime. On the other hand, its bright autumn colouring will make any garden look a little livelier when most other deciduous plants have already shed their leaves. Forsythia ‘spectabilis’ hedges can handle any soil type and position. They do, however, have a preference for moist, well-drained soil, but they can also tolerate poor soils. 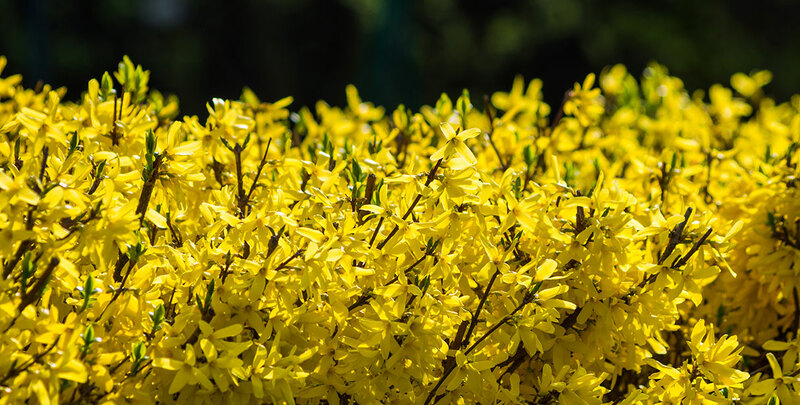 This variety of forsythia is quite frost hardy and will do well in full sun to partial shade, where it can grow up to 4 metres tall at a vigorous growth rate of 40 centimetres per year. This cultivar does have a tendency to grow quite large, so in most gardens, it will be necessary to keep it in check with some pruning. It can cope with rigorous trimmings, so do not hesitate to cut it back to an acceptable height or width. Luckily, it is relatively easy to trim this type of hedge. Another reason why a forsythia ‘spectabilis’ hedge should absolutely be trimmed annually is the fact that it will stop producing its colourful flowers if you do not. Since these flowers are likely the most important reason why people choose to plant this type of hedge in their gardens, we strongly advise you to trim your forsythia ‘spectabilis’ hedge every year. After flowering, the flowers will turn brown and wither. When this happens, the right time to trim your hedge has arrived. If you cut the branches that have flowered back to a couple of centimetres above the ground, you will soon see new shoots that will develop into strong branches with vibrant yellow flowers during the following year. 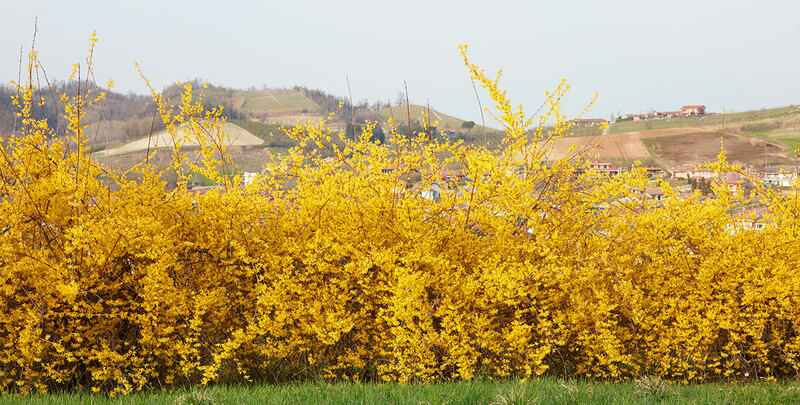 Why Choose a Forsythia Hedge? Bright, colourful and vibrant – that’s the forsythia ‘spectabilis’ in a nutshell. It is one of the most suitable hedge plants for mixed hedging, but it also makes a beautiful informal hedge. The fact that this cultivar flowers early will make you look forward to sunny days, while most other hedging plants still have a relatively monotonous look. But even during the autumn, the colours of your forsythia ‘spectabilis’ hedge will make your garden look stunning. If you want your garden to stand out during the autumn months, the spectacular colouring of the forsythia ‘spectabilis’ will certainly help it do so. In addition, maintaining a forsythia ‘spectabilis’ hedge is relatively easy. It will certainly reward you by growing new, beautiful flowers if you give it the maintenance it requires. Its maintenance requires a little precision, but it is certainly worth the effort. This forsythia cultivar will have a different appearance for each season and therefore, it is the perfect hedging plant to display the changing of the seasons to anyone who passes your garden.